You can disable a proposal link to prevent your client from viewing it. 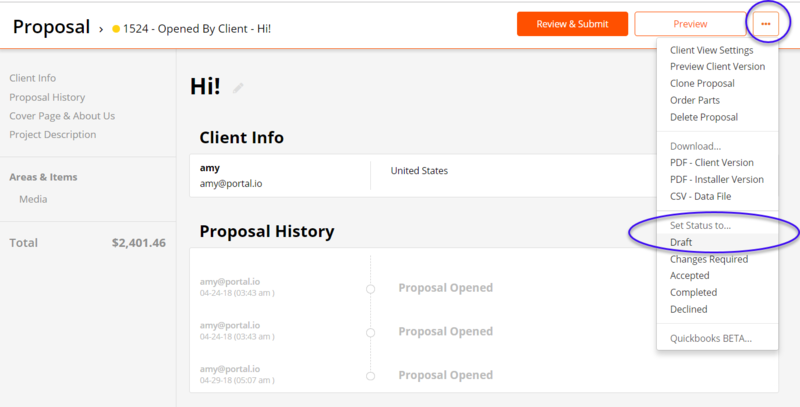 If you send a proposal by mistake or don't want the client to have access to it anymore, move it back to Draft status. You'll still keep all of the information from the proposal within your account, but by setting it to Draft the initially submitted proposal link will no longer direct to a live page where it can be viewed. To move it back to draft, open the options menu and select Draft. If you'd like to grant access to the proposal again, you can submit it again and your client will receive a new email and live link.